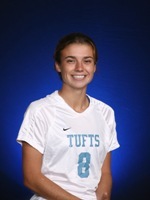 MEDFORD -- The Tufts University women's soccer team, which will play in an NCAA Tournament first round game on Saturday against Emmanuel College, had three players named to the 2007 New England Small College Athletic Conference (NESCAC) All-Conference teams on Thursday. Sophomore forward Cara Cadigan (Nahant, MA/Swampscott), who set a single-season record for goals at Tufts, was elected to the first team and picked as Rookie of the Year. 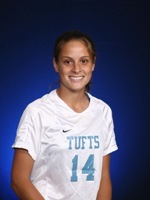 She was joined on the first team by senior midfielder Martha Furtek (East Falmouth, MA/Falmouth). Senior defender Annie Benedict (Millburn, NJ/Millburn) was voted on the second team. Cadigan was eligible for Rookie of the Year after missing her freshman season completely due to a knee injury. She came back strong, scoring 17 goals including 10 game-winners. That broke the previous mark of 15 goals scored by Lisa Raffin in 1981. In nine NESCAC games, Cadigan scored seven goals and they were all-game winners. She also had five assists overall and is the NESCAC's leading scorer with 39 points heading into the NCAA Tournament. 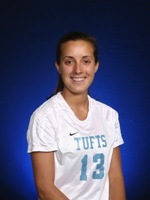 Cadigan is the first Tufts Rookie of the Year since Jessica Trombly for the 2000 season. This is the fourth All-NESCAC selection for Furtek. She was a second team pick in her first year, and has been on the first team in each of the three years since. Once again she was at the center of the Jumbos offensively, scoring three goals and assisting on four others for 10 points. Coach Martha Whiting installed a new system for the 2007 season and Furtek's skill at midfield smoothed the transition. Benedict was an All-NESCAC second team pick last year, too. This fall she was one of a veteran line of Tufts defenders in front of sophomore goalkeeper Kate Minnehan (Hopkinton, NH/Hopkinton). Tufts is currently third in the conference with just 14 goals allowed in 16 games this season. Their seven shutouts are tied for third most in the league. Tufts finished second in NESCAC this fall with a 7-2 mark. They bring a 12-3-1 overall record into the NCAA Tournament. The Jumbos are traveling to Hamilton College in Clinton, New York for the first round. They play Emmanuel at approximately 1:30 pm. The winner of that game will play either Hamilton or Moravian on Sunday at 1:00 pm in the second round.